Jail all living artists. Elvis stays. The recent Supreme Court ruling on copyright extension gives culture less incentive than ever to support artistic endeavors. The Supreme Court’s Jan. 15 decision to uphold the 1998 Sonny Bono Act extends copyright to life of the creator plus 70 years, and 95 years for corporate copyrights. Designed to withhold Mickey Mouse from the public domain, the extension has been sold as a way to reward artists for their creations. But since copyrights on revenue-generating works are rarely held by artists or their families, this can’t be viewed as the Act’s primary intention, which is to increase the value of copyrights already maintained by corporations. Lawrence Lessig, known as a champion of copyright reform, unsuccessfully argued against the Act before the court, losing by a margin of seven justices to two. But even Lessig has no apparent interest in protecting living artists; the principal interest of his client, Eric Eldred, was unfettered access to the literary tomb of Robert Frost. Consequently, Lessig’s suggestions for self-regulating copyright reform is that living artists get even poorer. One proposal would have artists voluntarily limit their copyrights to fifteen years – in other words, diminish the potential earning of their work in an environment where corporations expect infinite holding. Another proposal by Lessig would have the work of unrecognized artists go immediately into the public domain, another boon to corporations. The unending legal battle over the Jack Kerouac estate gives perspective to what often happens to the heirs of artists. While Jan Kerouc (Jack’s daughter) is denied entrance to Kerouac symposiums, Paul Blake (Jack’s nephew and intended heir) lives out of his truck in the streets of Sacramento, California. And as it should be. It isn’t a good idea for artists, or people genetically predisposed to be at risk for creativity, to have money, or control over anything. Far better they don’t. Artists are a whining, irresponsible lot. No purchasing power, no insurance, no justification for being—so why not just finally get to it, and legislate this social blight out of existence? The risks to society when such weak links are afforded any such self-determination, let alone cultural influence, greatly outstrip any advantage. Take Michael Jackson. Yes, he produced a few good songs, but can one really suppose that he wouldn’t have produced those songs if he had remained safely nestled amongst concerned record executives? Certainly, had he availed himself of that protection, his nose wouldn’t have melted off his face, and someone would have wised him up to the fact that boys don’t belong in his bed, and babies don’t really bounce. With Jackson’s own purchase of Beatles songs, and his brief involvement with Priscilla Presley, it doesn’t take a leap of logic to confirm that even Jackson suspects artists are best when they have no interest in their own creations—which means, of course, that they’re at their very best when they’re good and dead. The United States is no longer such a young nation that it needs to cultivate an identity through ongoing artistic pursuits. We’ve had artists in this country for 300 years, and even if there wasn’t a new writer or painter or sculptor or actor for, oh, 100 years (by no accident was the copyright extended to 95 years), it’s hard to imagine that anyone would notice the difference. There’s plenty of cheap art and writing by dead people, and nobody would have any trouble finding new sources to exploit. In a pinch, there’s always Shakespeare. That said, it’s unlikely that corporations would need anything new. Look to the current publishing industry, which profits almost entirely from peddling its backlist, or the Museum community, which is increasingly subsidized by corporations heavily invested in “great masters,” and which has turned markedly away from living artists, in favor of dead ones. Everyone knows there won’t be another Picasso or Dosteovsky, and that all those pretentious jokers out there painting paintings or writing books are just dilettantes who haven’t the slightest clue what they’re doing. The only laudable endeavor that such an “artist” might take on would be to get permission from the Margaret Mitchell estate to write an official sequel to the official sequel of Gone With The Wind. Still, while it’s probably a better policy to just to put an end to the arts altogether, one might reach a compromise. One might say, yes, artists will be permitted to continue working, but only in jail. (Most artists are so destitute that they would readily agree to the stipulation.) In the case of music, this arrangement could prove especially productive. With VH1’s “Music Behind Bars” televising of the all-felon band Dark Mischief, it’s clear enough that musicians thrive in jai. Moreover, nobody gets murdered, raped, or robbed. Teenagers need a healthy outlet for their revolutionary impulses, and this would allow them to let off some steam, while at the same time educating them as to the dangers of a rock’n’roll or hip-hop lifestyle. A bit of good fun—but with a moral attached. Theater is another instance where the arts have been demonstrated to prosper behind bars. Theater critics everywhere are raving about the Shakespeare dramas staged yearly at the Luther Luckett Correctional Complex in LaGrange, Kentucky, which also goes to show how well artists and criminals can get along, if it proved too complicated to jail them separately. There will be the parsing of who is and who isn’t an artist, and some will insist that movies have nothing to do with the arts. This sort of detail can easily be worked out with a common-sense distinction: actors could remain on the streets, as long as they don’t write or direct anything, and work as waiters or waitresses. Cinemaphiles need not panic—ask any producer—as we don’t need writers or directors to make movies. And one might point to the technological advances toward computer-animated entertainers, which will eliminate the degenerate profession of acting. What about fashion? Well, designers could be judged case by case. Martin Margela? Jail. Kathy Ireland? No, no need to jail her. Jean Paul Gaultier? Parole. Clear enough. So, jail the artists. But how do we round them up? My initial thought was that we might, somehow, attract them all to an island, and then put a wall around it. And then I realized, Manhattan is that island. All we need to do now is wall it off. Anyone we nab later, in Brooklyn or the rest of the country, we can just slingshot in. And what about people who are secretly creative? Yes, a huge percentage of the population harbors fantasies of writing novels and such. But one must remember that people also have criminal impulses all the time, and yet we only jail them if they act on their criminal impulses, as it would be Orwellian to prosecute thought crime. Artistic wannabes are no different. Besides, once all artists are behind bars, it’s likely that many artistic daydreams will disappear, or be pushed so deep into the unconscious that they’re just as good as disappeared. 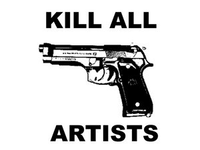 Many New Yorkers are aware that over the last several years these issues have led to a sticker and t-shirt campaign to “Kill All Artists.” That would help too, certainly. But first, shouldn’t we at least try to rehabilitate them? Okay, you say—but what about the costs? Here lies the true beauty of the system. With none of the risks (the snappish remarks, the crime sprees), society might have all the benefits (free art, free entertainment). You put artists in jail, and have them work in total isolation, and then sell their creations, and never even reveal to them who among their ranks is important, and who isn’t. Either that, or you wait till they’re dead. Regardless, artists would be, for lack of a better word, enslaved, and, by that step, prisons would profit big, and leave the taxpayer untouched. So, I beseech lawmakers, put an end to obnoxious, confusing cocktail-party comments. Cease the assault on great artists of the past—artists whose works are already copyrighted, or artists whose works are already public domain. In other words, artists whose works don’t cost anything! Why fight it? We’ve already got Elvis. We’ve already got Shakespeare. Why detract from their cultural victory? Here, in America, things are great the way they are. And, frankly, it’s un-American to disagree. So, let’s get to it, and throw those goofballs into the can.